Many development actors see participation as the key to increasing citizens' influence over the institutions and policies that affect their lives. In some places, spaces for citizen participation have been created by the state. In others, citizens have created spaces for participation themselves. This research programme carried out empirical research focused on both state-created and popular spaces for participation. It explored the dynamics of participation in these spaces, and the relationships between different kinds of local institutions, actors and sectors affiliated with the spaces to better understand the opportunities, constraints and limitations that these spaces offer to truly influence the institutions and policies that affect people's lives. The programme was co-convened by Andrea Cornwall (IDS) and Vera Schattan (CEBRAP) and involved partners from Mexico, Brazil, South Africa, Bangladesh, India and the UK. In this paper I argue that citizen involvement helped to promote a more equitable distribution of public health services in Brazil. This achievement involved a balance of contributions from social actors and health system managers in forging policy innovations and institutional arrangements that linked bottom up innovation with national policy leveraging and decentralized implementation. The paper briefly describes this cycle and its relation with the implementation of a national network of forums for citizen involvement in health policy, inquiring in more detail the conditions that favor the association between these forums and the policy making process. Our results do not corroborate the idea that deliberative arenas should be insulated from political passions; rather, they suggest that participation of mobilized social actors contributes to the effectiveness of these forums. This contribution happens both due to the knowledge that these actors bring about problems in the area and to their insertion in networks that connect forums to a wide set of social organizations and political, governmental, and health institutions, which in turn facilitate the dissemination and negotiation of the proposals and demands formulated by the forums. Despite these achievements the results also call attention to a slight increase in inequality in the distribution of basic services between the poorest regions. In the two decades since military rule ended in Brazil,there has been a remarkable flowering of new democratic practices and spaces for participation. Brazilâs 1988 âCitizensâ Constitutionâ created the legal basis for some ofthe worldâs most progressive democratic institutions. Democratic innovations such as participatory budgeting (orÃ§amento participativo) have brought Brazil to the forefront of debates on tackling democratic deficits through participatory governance. Brazilâs social movements and left-wing political parties have played an active part in this process of democratisation, engaging citizens in making demands on the state and claiming their rights, and promoting new, expanded understandings of citizenship and democracy. What lessons do Brazilâs democratic experiments offer other countries? 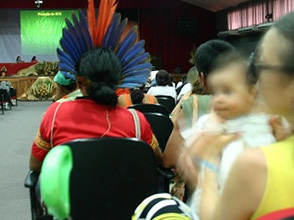 This briefing shares some of the insights that arose from a DFID-Brazil funded project called Olhar CrÃ­ticoâ âa critical lookââ that brought together activists, academics and practitioners in an innovative research process,to enquire,with a critical eye,into Brazilâs experiences with participation in governance. This two-page document summarises a study of the role of Aboriginal people in the deliberative aspects of the Romanow Commission, established in April 2001 by the Canadian government to deliberate with citizens on the future of healthcare in Canada. This two-page case study summary describes how in a city in the UK with a troubled political history, residents in one neighbourhood discovered that the Health Authority was planning to close their health centre, so they mobilised and undertook research to stop the closure. This two-page document summarises research into Bangladesh's attempt to enhance community participation in the public health sector. In A Cornwall & VSP Coelho (eds) Spaces for Change? The Politics of Citizen Participation in New Democratic Arenas. London: Zed. Due to copyright restrictions, we can only share the first three pages of this chapter online. The book can be ordered from Zed Books at www.zedbooks.co.uk/citizenship or purchased at the IDS bookstore. In recent years there has been a proliferation of new democratic spaces for citizen participation in South Africa. These range from âinvitedâ spaces created by the government to spaces created by poor people themselves. Whereas the former are often set up in response to legal guarantees for citizen participation, the latter are initiated in response to the failure of the government to deliver services or fulfill promises, and to include citizens in decision-making. This chapter discusses two cases of grassroots citizenship engagement, in South Africaâs health and land sectors: the AIDS/HIV organization, the Treatment Action Campaign (TAC), and citizen engagement around land politics. This book addressed one of the biggest challenges of our age: that of building democratic politics where all can realise their rights and claim substantive citizenship. In recent years, innovations in governance have created a plethora of new democratic spaces in many countries. Yet there remains a gap between the intention to institutionalise participation and the reality of exlusion of poorer and marginalised citizens. Through case studies of a diversity of institutions - hospital facility boards in South Africa, a national-level deliberative process in Canada, sectoral management councils and community groups in Brazil, India, Mexico and Bangladesh, participatory budgeting in Argentina, NGO-created forums in Angola and Bangladesh, community forums in the UK, and new intermediary spaces created by social movements in South Africa - contributors examin how the democratic potential of these new spaces might be enhanced. Brazilian Health Councils: Including the Excluded? Due to copyright restrictions, we can only share the first three pages of this chapter online. Brazilâs participatory policy councils may have gained less international attention than Participatory Budgeting. Yet the thousands of sectoral participatory policy councils that have come into being since the early 1990s, with their hundreds of thousands of civil society representatives, are as significant a democratic innovation. As the literature on Brazilian health councils continues to grow, it has become evident that the promise of these new democratic spaces is proving less easy to fulfill than their architects might have imagined. Analysts have drawn attention to the gap between the ideals of deliberative governance and the realities of pervasive cultures of politics and the replication of embedded inequalities in conduct within these spaces. The tension between the assumptions about participation, accountability and democracy that are embedded in contemporary debates about participatory governance and deliberative democracy, and the understandings and practices of the actors who animate these institutions is under-explored in this literature, and forms the focus for this paper. Through an extended case study of an incident in the life of a municipal health council in a small municipality in the impoverished north-eastern Brazilian state of Pernambuco, it seeks to explore the meanings and practices associated with democracy in this context. To do so, it deploys a technique unfamiliar in much of the literature on governance: ethnographic âthick descriptionâ. By evoking everyday meanings and practices of democracy in the council, the paper seeks to demonstrate the importance of locating the normative assumptions that are embedded in theories of deliberative democracy and participatory governance in lived experience in particular cultural, historical and political contexts. Este artigo discute a experiÃªncia brasileira dos Conselhos de SaÃºde. De inÃ­cio, faz uma revisÃ£o da literatura que analisa os fatores que contribuem para a âlegitimidade democrÃ¡ticaâ dessas experiÃªncias. Em seguida, sÃ£o apresentados os resultados de um estudo realizado com os Conselhos Locais de SaÃºde das 31 subprefeituras da cidade de SÃ£o Paulo. Na conclusÃ£o, discute-se, Ã luz desses resultados, a importÃ¢ncia relativa dos diferentes fatores identificados pela literatura como centrais para o estabelecimento da legitimidade democrÃ¡tica desses ânovos espaÃ§os democrÃ¡ticosâ. The South African post-apartheid constitution provides for community participation in the construction, implementation and evaluation of integrated development planning at local level. This article reviews and assesses community participation in practice drawing on the findings of a range of research projects conducted in Cape Town since 1994. It is argued that contemporary understanding of community participation in South Africa is informed by the memory of community struggle a radical form of participation against the racist apartheid State. This means that communities have a richly-textured history of strategic mobilization against exclusionary and discriminatory government practices at the local level. It is precisely this repertoire of radical strategies that can and should be revisited and adapted, to advance the interests of the materially marginalized communities at the local level. âPeople drivenâ development programmes through Integrated Development Planning (IDP) in post-apartheid South Africa in general, and Cape Town in particular, have thus far been largely rhetorical and not substantive. Hence, the enduring challenge of the perennial question at the grassroots level remains in whose interest is community participation really driven? The limits of democratisation strategies which focus only on the formal electoral arena are becoming increasingly clear. In both North and South, interest is now growing in approaches to "deepening democracy" which seek to extend the range and scope of opportunities for citizen participation. This has led to a proliferation of new democratic spaces. This IDS Policy Briefing takes a closer look at examples of these spaces in a number of very different countries. It argues that if they are to avoid becoming just another set of one-size-fits-all models, much more attention needs to be paid to key contextual factors as well as to institutional design. The Briefing concludes with some practical lessons on dealing with the key challenges which ânew democratic spacesâ pose for policymakers and for citizen representatives. Contemporary discussions of âdemocratic innovation experiencesâ have evolved into a heated debate about how effective these ânew spacesâ are in including ordinary citizens, particularly those traditionally marginalized and excluded. This article focuses on the Brazilian experience with Health Councils and begins by discussing the conditions that have been pointed out by previous studies as favouring the inclusion of these groups in these ânew spacesâ. On the basis of these studies, one question that remains is about the democratic legitimacy of these experiences, as it seems that there is a bias towards the inclusion of those that already have political ties with the traditional political system. The local Health Councils in 31 subprefeituras (new administrative subdivisions) of the city of SÃ£o Paulo were researched and a continuum was observed: ranging from a small number of one or two sectors that have historical ties with political parties included in the council to a far more diversified composition, including up to seven sectors with autonomous representatives and various types of association. Using these results as their starting-point, the analyses conclude with a discussion of the relative significance of the factors previously identified as central in establishing the democratic legitimacy of these ânew democratic spacesâ. This article argues that there is a dialectical relationship between development planning and citizenship in so far as planners, as institutional decision-makers, ensure a meaningful everyday lived experience for ordinary people. In post-apartheid South Africa, however, the statistical record signals a disjuncture and structural hiatus between what should be the basic rights of ordinary people and the role of local government in promoting citizen-driven development planning at the grassroots level. This article deals specifically with the Wallacedene community, who took the planning authorities to court to have their constitutional right of access to adequate housing and related services enforced. The implications of this court case vis-a-vis development planning are considered and recommendations are proffered. The 1988 Brazilian Constitution, which established the formal transition to democracy, sanctioned the decentralization of policymaking and established mechanisms for citizens to participate in the formulation, management, and monitoring of social policies. Hundreds of thousands of interest groups worked throughout the country as the constitution was being drafted and collected half a million signatures to demand the creation of participatory democratic mechanisms. authorities, this paper suggests a range of conceptual, theoretical and practical steps to advance transformative planning practices at grassroots level. Hence the importance of substantive elements of community participation such as the initiation, identification, orientation and authentication of participatory processes. Detailed fieldwork in Sao Paulo, Brazil, shows that the conventional understanding of civil society and citizen participation is flawed in two major ways. The dominant focus on the participation of individual citizens is misplaced, as it is civil organizations representing different sectors of the poor that participate in substantial numbers in participatory institutions. The civil society approach in international development suggests that the most effective voice of the poor in policy making comes from civil society organizations (CSOs) that are independent of political parties and state agencies. Across different participatory institutions in Sao Paulo, however, the most active representatives of the poor are those well connected to conventional political actorsâpolitical parties and state agencies. This connection between civil and political actors suggests the need for a ââpolity-centeredââ approach to understanding issues of participation and representation. reconfiguration of representation or on the democratising of democracy. Furthermore, there are no well-established theoretical models beyond the classic electoral or membership ones which set out how civil organisations could establish their representativeness. The vast majority of civil organisations in middle-and low-income countries, however, are not membership based and few make use of electoral procedures to authorise a mandate or establish accountability. In recent years, the emphasis of the New Labour government on partnership and civil renewal has opened up new governance spaces in the UK. These spaces have provided new opportunities for voluntary and community organisations (VCOs) but also posed new dilemmas. This article draws on research into the role of these organisations in the policy process, exploring how open the new spaces are, who is engaged in them and what scope for influence they offer. It concludes that, while there is room for optimism, operating in these new spaces can be risky and challenging. It welcomes the growing dialogue between North and South and the resource that this offers for negotiating the challenges they pose. Across the world, as new democratic experiments meet with and transform older forms of governance,political space for public engagement in governance appears to be widening. A renewed concern with rights, power and difference in debates about participation in development has focused greater attention on the institutions at the interface between publics, providers and policy makers. Some see in them exciting prospects for the practice of more vibrant and deliberative democracy.Others raise concerns about them as forms of co-option, and as absorbing, neutralising and deflecting social energy from other forms of political participation. The title of this Bulletin reflects some of their ambiguities as arenas that may be neither new nor democratic, but at the same time appear to hold promise for renewing and deepening democracy. In the USA, poor people have relatively little power. While they can vote and create organisations to represent their interests, their power is severely limited by the fact that they are a relatively small minority within an enormously wealthy country. This article investigates an environmental governance mechanism in Brazil: the Public Hearings for Environmental Licensing (Aplas). Through a case study - a ring road currently under construction around the Sâo Paulo Metropolitan Area - we evaluate the effectiveness of this mechanism that seeks to expand popular participation in the public discussion of enterprises with potential environmental risk. Analysing the social profile and the cognitive and material resources of the Aplas potential participants as well as Aplas modus operandis, we argue that Aplas present the same problems pointed out by the literature on the functioning of deliberative processes: the most active agents are pre-established elites; authorities have agenda control; Aplas have low influence on environmental public policies. Hence, we conclude that Aplas lack of legitimacy and efficacy, not being able to ensure the effective participation of ordinary citizens in the environmental licensing process. This article examines emerging forms of participation in a variety of spaces in Chiapas, in the south of Mexico, situated within a complex socio-political context. A range of different relations between marginalised groups, social movements, and the government are articulated through experiences of participation both in created and invited spaces. The Zapatista movement has fostered changes in relationships between marginalised groups, including indigenous people and women, and the state - particularly the national government and regional development programmes created during the last several years. These regional programmes represent the national governments position on important issues, including the nature of socio-economic regional development, indigenous peoples rights, and the protection of environmentally sensitive areas. Differences and commonalities in participation in spaces created by the Zapatista movement in autonomous municipalities, versus participation in formalised spaces within the governments regional development programmes provide some important insights about the role of participation in bringing about change. The South African post-apartheid government has made a number of laws since 1994 that make it possible for ordinary people to play a meaningful role in the affairs of local authorities. Local authorities are, for example, obliged to consult citizens with regard to Integrated Development Planning at grassroots level. Towards this end, the City of Cape Town established Areas Coordinating Teams (ACTs) in 1999 in several townships with a view to empowering historically marginalised and excluded communities. This article investigates whether or not ACTs are an effective medium to represent the voices of ordinary people in matters of local governance. It concludes that community participation, as in ACTs, appears to be functionally truncated, institutionally manipulated and are thus structurally limiting. This means that ACTs merely serve to ratify rather than influence/change official behaviour and that communities are only consulted as long as they support the goals of particular officials or politicians. This document is a brief summary of the Citizenship DRC's research on South Africa's Area Coordinating Teams (ACTs). South Africaâs post-apartheid constitution requires local authorities to consult communities prior to any decision being taken that might affect them. ACTs are a key mechanism for doing this in the city of Cape Town. However, it is only when these teams develop from being simple symbols of participation to real instruments of change that they can make a real difference in their communities. A multiplicaÃ§Ã£o de expedientes de participaÃ§Ã£o coletiva e direta implementadas e praticadas nos Ãºltimos anos em paÃ­ses de renda mÃ©dia e baixa parecem anunciar uma nova polÃ­tica democrÃ¡tica. ExperiÃªncias inovadoras como o orÃ§amento participativo nas cidades brasileiras, bem como os espaÃ§os de participaÃ§Ã£o e deliberaÃ§Ã£o polÃ­tica, na capital uruguaia, MontevidÃ©u, e no Estado indiano de Kerala estÃ£o criando amplas arenas democrÃ¡ticas e novas prÃ¡ticas fora das fronteiras das instituiÃ§Ãµes de representaÃ§Ã£o polÃ­tica clÃ¡ssicas.2 Uma vasta gama de pesquisadores, formuladores de polÃ­ticas pÃºblicas e lÃ­deres polÃ­ticos acredita que a participaÃ§Ã£o direta na elaboraÃ§Ã£o de polÃ­ticas pÃºblicas pode ajudar tanto a democratizar e racionalizar o Estado quanto a dar voz polÃ­tica aos grupos politicamente marginalizados. Recent times witness many new ways through which peoples engagement is sought by the state. Amongst them, the creation of local institutions for representation, deliberation, and decision making at the village level is perhaps the most important. Seldom existing in isolation, these local developmental institutions intersect, interact and, at times, overlap with other local institutions. What shape participation eventually takes within these developmental spaces is thus contingent not only on the dynamics taking place within them, but also to a large extent on their relationship with coexisting local institutional spaces. This article explores the institutional dynamics within and between local institutions for forest management in the hilly villages of Uttranchal in northern India. Creating and institutionalising spaces such as these, the article argues, provide necessary, but not sufficient conditions to ensure the democratisation of participation. These institutional spaces have the potential to create certain conditions for participation and democracy at the local level, but they can also restrict such possibilities and therefore, must not be conflated either with participation or with democracy. The study focuses on the linkages, conflicts and dynamics between the traditional, developmental and statutory institutions to explore participation of people in their local forest management. The study focuses on the developmental institution specifically created by the state for the management of local forests and explores its interaction with traditional institution - which also in various ways is created and regulated by the state, aleit incorporating the traditional ways of forest management as they evolved historically - on the one hand and the constitutionally mandated statutory institutions of local governance on the other, to depict the nature of participation as it actually takes place. The study argues that whilst these institutional spaces have potential to create certain conditions for participation and democracy at the local level, they can also restrict its possibilities and therefore, must not be conflated either with participation or with democracy. Citizen engagement with institutions and policy processes gives shape and content to the meaning of citizenship by placing obligation on both citizens and state, and helps to ground the abstract relationship between state and citizen within the consciousness of people. Participation meets the concern not only for citizen voice but also for citizen agency. This article explores peoples perceptons and reality about participation in newly opened spaces within the Bangladesh public health care delivery system. The empirical findings suggest that the effectiveness and ability of community groups to function as spaces for participation and provide the means for developing capabilities to participate is limited, being constrained by poverty, social inequality and dependency relationships, invisibility, low self-esteem and absence of political clout. Neither have these groups been able to foster a sense of community, since perceptions of rich-poor differences in capabilities and responsibility remain strong. This article explores the organisational practices and strategies of the Treatment Action Campaign (TAC), an AIDS activist social movement in South Africa. TAC, like other new social movements, draws on grassroots, bottom-up, network-based modes of organisation that operate simultaneously in diverse local, national and global spaces. The article argues that TAC provides examples of organisational practices that cut across institutional and non-institutional spaces, and that are capable of generating multiple relations to the state. In doing so, it has provided its members with opportunities to engage simultaneously in a variety of participatory spaces that allow for the articulation of new forms of citizenship from below. The concept of democracy has been widely accepted, however it is still poorly understood. This book addresses that paradox. It provides insights to better understand the role of democratic institutions and to find a way to revitalise them. The book examines how the idea of deliberative democracy can provide mechanisms for citizen engagement; it also analyses the experiences of participatory budgeting, public councils, and other participatory mechanisms in Brazil. By doing so, it explores the nature of those innovative institutions and formulates new concepts useful to explain the role in participation and deliberation that these institutions must have within a democratic state. in Ziccardi, Alicia (ed.) ParticipaciÃ³n ciudadana y polÃ­ticas sociales en el Ã¡mbito local. Indesol, MÃ©xico D.F. El artÃ­culo hace una revisiÃ³n de los trabajos sobre participaciÃ³n ciudadana, identificando dos grupos de autores: los que atribuyen el suceso o fracaso de los mecanismos participativos al grado de movilizaciÃ³n de la sociedad civil, y los que asocian esos resultados al tipo de compromiso de las autoridades polÃ­ticas con esos mecanismos. A partir de esa revisiÃ³n se plantea la pregunta que sigue: como esos actores, sociales y estatales, consiguen transformar instituciones poco efectivas en instituciones que contribuyen para hacer valer los intereses de los menos favorecidos? En un intento de responder la cuestiÃ³n se presenta un estudio sobre los consejos de salud â municipal y distritales â en el MunicÃ­pio de SÃ£o Paulo y se argumenta que el suceso de los mecanismos participativos estÃ¡ asociado no solo al grado de movilizaciÃ³n y compromiso de los actores citados, sino tambiÃ©n a su interÃ©s y capacidad de promover innovaciones institucionales que garanticen reglas claras de representaciÃ³n polÃ­tica, asÃ­ como tambiÃ©n procesos de discusiÃ³n y toma de decisiones que lleven a una participaciÃ³n efectiva de los representantes con menos recursos argumentativos y conocimientos tÃ©cnicos. A participaÃ§Ã£o foi incorporada Ã agenda polÃ­tica brasileira com a ConstituiÃ§Ã£o de 1988. Nessa ConstituiÃ§Ã£o estÃ¡ inscrita a aposta em um Estado de Bem Estar abrangente que seria viabilizado a partir de trÃªs estratÃ©gias principais: a ampliaÃ§Ã£o de financiamento para as polÃ­ticas sociais, a descentralizaÃ§Ã£o e a participaÃ§Ã£o social3. Nesse projeto o papel da participaÃ§Ã£o social seria tornar o processo de formulaÃ§Ã£o e gestÃ£o das polÃ­ticas pÃºblicas mais permeÃ¡vel Ã s reais demandas da populaÃ§Ã£o e, tambÃ©m, mais transparente e aberto ao controle social. Essa contribuiÃ§Ã£o seria decisiva para aproximar essas polÃ­ticas das reais necessidades da populaÃ§Ã£o e contornar problemas de falta de qualidade e iniqÃ¼idade. Esse artigo se concentra na analise da implementaÃ§Ã£o, a partir dos anos 90, dos conselhos de saÃºde enquanto instituiÃ§Ãµes que devem viabilizar a participaÃ§Ã£o na polÃ­tica de saÃºde e argumenta que a participaÃ§Ã£o social nÃ£o depende apenas, como tem se sugerido na literatura, do grau de organizaÃ§Ã£o e comprometimento dos atores da sociedade civil e do Estado. Mas que depende, tambÃ©m, do interesse, e da capacidade desses atores de definirem as condiÃ§Ãµes de legitimidade democrÃ¡tica desses espaÃ§os, seja atravÃ©s do estabelecimento de regras e procedimentos para a escolha dos que representarÃ£o a sociedade civil nesses espaÃ§os, seja atravÃ©s da organizaÃ§Ã£o, em seu interior, de processos de discussÃ£o e tomada de decisÃ£o que conduzam Ã efetiva participaÃ§Ã£o dos representantes que dispÃµem de menos conhecimentos tÃ©cnicos e recursos comunicativos. Increasing peopleâs voice and influence in the health sector is generally believed to be an effective way of improving the performance of health systems, i.e. increasing access to services of the most vulnerable and disadvantaged groups, improving health outcomes generally and reducing health inequities. Participation of communities in decision making in the health sector, through ownership and implementation of local health services and interventions, is now a widely accepted means of ensuring such influence. Not only that, by creating public pressure and generating debate, community participation, actually facilitates the democratic process, reduces the gap between state and citizens and complements state responsibility for ensuring citizenâs right to health and other services. In that respect informed and more inclusive community participation is not only good for the health system but also good for promoting citizenship practice and in claiming the right to good health care. Civil society organisations participate as representatives of a range of social groups, values and interests in the participatory budget and deliberative policy councils in the city of SÃ£o Paulo, Brazil. This participation is significant, both in terms of numbers of organisations and in terms of organisationsâ assessment of the value of participation. In our study of civil society organisations who work with or for the urban poor and working class, 59 percent had some form of participation and the vast majority of those who participate stated that doing so was very important or indispensable. One of the questions this poses is how do organisations that participate differ from those that do not and, what increases the likelihood of participation? discusses recent research into the diversity of sites and practices of public participation in two contrasting English cities, Birmingham and Liverpool.1 It explores the perspectives of citizens and officials on participation and examines the construction of âthe publicâ, the negotiation of legitimacy and how questions of difference and diversity are managed in spaces for participation. Our analysis reflects on issues of interaction and institutional design within forums for public involvement, the interaction between representative and participative democracy in the public policy field and how the tensions between representative and participative democracy are reconciled, or not. Using the concept of space as a lens through which to view practices of participation, this paper seeks to explore issues of power and difference in the making and shaping of spaces for participation in development. It examines the emergence of different kinds of space for participation in development, highlighting salient tracks and traces in previous times and their imprint on contemporary practice. It goes on to explore the dynamics and dimensions of participation in institutionalised and non-institutionalised spaces, both those of invited participation and more organically created spaces, made and shaped by people for themselves. The paper concludes that supporting the realisation of inclusive, active citizenship calls for a greater understanding of the micro-politics of participation as a situated practice. This, in turn, calls for approaches that locate spaces for participation in the places in which they occur, framing their possibilities with reference to actual political, social, cultural and historical particularities. actors, and the Workersâ Party and State actors in particular, have the highest propensity to participate. The findings also support the idea that the institutional design of participatory policy-making spaces has a significant impact on who participates, and that this impact varies by type of civil society actor. Unlike what has been found in research on individual citizen participation, there is no evidence that the âwealthâ of collective actors influences participation. The paper talks about the interface between institutions created for forest management and how this interface impacts on peoplesâ participation in the management of their forest resources. These institutions operating in the field of forest management are of two types - the government institutions which are instrumental in shaping polices and programmes related to forest management and actually implementing them; and the other set of institutions responsible for forest management comprising of local people and operating at the village level. These village institutions have a direct linkage with the higher order government institutions that form and supervise them. The paper by focussing on the interface, both supportive and problematic, between these institutions operating in the field of forest management in the Kumaon region of the newly created state of Uttaranchal in India, reveals the dynamics of participation at the local level. In recent years, citizens in many countries have been on the receiving end of a wave of interest from governments, NGOs, donors and lenders in ways of involving them more actively in shaping decisions that affect their lives. Innovative experiments in governance have opened up spaces for public involvement in deliberation over policies and a greater degree of control over certain kinds of resources. Levering open arenas once closed off to citizen voice or public scrutiny, these moves have helped to widen political space for citizens to play more of a part in shaping some of the decisions that affect their lives. ï»¿ï»¿Around the world, there has been growing interest in ways to enhance public involvement in governance, and with it the quality and legitimacy of democratic decision-making. The intersection of growing demands to be included with the widening of political space, in some contexts through changes in laws and policies, complement conventional models of political participation and with a new architecture of democratic practice. Whether in budgeting, policy dialogue, planning, project appraisal, poverty assessment, monitoring or evaluation, participatory alternatives to expert-driven processes have gained ground. At the same time, contextual variation in constitutional and legal framework, the forms and styles of political and civil activity, and histories of engagement with external actors, etch distinctive traces on the invited spaces that have become the new development blueprints. Using the concept of space as a lens through which to view practices of participation, this paper seeks to explore issues of power and difference in the making and shaping of spaces for participation in development.